Priorat is a predominantly rural, sparsely populated region situated in the northeast of Spain, 120 kilometres southwest of Barcelona. The relief is characterised by narrow valleys and steep mountains. Priorat has a famous winemaking history that began in the 12th century with the Carthusian monks of Scala Dei. The vineyards are planted on the steep slopes, which rise from 100-700 metres. In the 19th century there were about 15,000 hectares under vine, but by the late 1980s a mere 900 hectares remained, mostly old vineyards high on the slopes, hard to get to and punishing to work. Three events led to the decline of Priorat: the 19th-century sale of Scala Dei�s lands, an outbreak of phylloxera that devastated vineyards in 1900, and mass tourism that pulled people away from Priorat to the coast in the 1960s. Twenty years ago, the Priorat region was on the verge of extinction, with grape prices so low that this was one of Spain's most impoverished regions. The decline seemed irreversible, and as late as the 1980s, only one single-lane road connected Priorat's crumbling medieval towns to the rest of Spain. It took a few visionaries to realise Priorat's potential. Most agree Ren� Barbier initiated the Priorat revival. Working weekends with four other producers, he established a co-operative that put its first wine on the market in 1991. From that first release, American wine critic Robert Parker was a fan, going so far as to give this first vintage 100 points on his 100-point scale. The New York Times published an article extolling the virtues of the Priorat wines and prices soared, with wines commanding more than $300 a bottle. In barely 15 years, the wines from Priorat have gone from obscurity to the most expensive in Spain. Outside industrial wine investors such as Torres and Freixenet have begun acquiring land, and the number of producers has risen from 10 in 1989 to about 85 today. 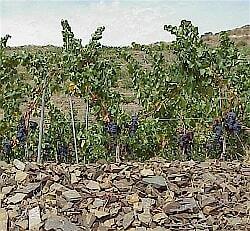 The revival of Priorat has seen vineyard area practically double since 2000, as have export sales. 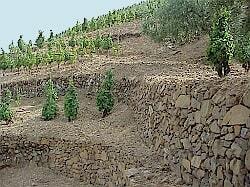 In 2005, its most recent audited year, Priorat exported nearly 552,000 litres of wine, a 9 percent increase on 2004. Though the region�s main client is the US, where nearly 200,000 litres are sold, the largest growth was seen on the UK market, where sales went from 20,000 litres in 2004 to 55,000 in 2005. It would be unjust to attribute this revolution to the new generation growers alone. The Priorat vineyards lie on gradients so steep that neither tractors nor any other kind of agricultural machine could possibly cope with them. Vine roots work their way down 10 to 20 metres through the carboniferous slate subsoil to tap pockets of moisture from infrequent Priorat rains. Very few grapes are produced and a single vine yields only about a kilo, a tenth that of the adjacent industrial wine region of Pened�s. The result, however, is wine of the highest quality. The typical local winery is small and non-industrial. The annual output of some of the smaller wineries is only five thousand prized bottles. Current trends appear to favour the small winegrowers and low production, the wines of great personality fruit of the hillsides and terraces. Tourism associated with Priorat's wine revival has led to the establishment of high quality restaurants operated by the wineries. This has helped to create a 'Priorat' quality brand that is now attached to other products in the region. Tourism, coordinated by the Leader Community Initiative, now operates as a basic promotional and marketing tool for other quality food, cultural and agriculture products. These include small shops specialising in traditional products, living museums converted from old warehouses and mills, guided tours to the wineries and walks through the vineyards. Wine and gastronomic tourism have thus combined to encourage local development and the agricultural recovery of a region traditionally considered as marginal. Priorat is a hotbed of wine innovation, with many variations in practices such as retention of stems, maceration times and use of new oak barrels for two years before bottling. But as quickly as Priorat's reputation was made, it could be lost as some of the new wines fail to live up to the region's high standards. The quick success of the small wineries lured Spain's largest wine companies. A building boom in the last five years has nearly doubled the number of wineries to 85. New Priorat wines, some priced as low as $11 a bottle, can now be found in wine stores. To try and ensure that quality is maintained, innovations continue, and wines stay ahead of the competition, Europe's first Science and Technology Park specialising in wine research and development is being constructed in Falset, the heart of the Priorat wine growing area. A Science Park of Wine Technology opened in 2009 in Falset, the heart of the Priorat wine growing area. It is intended as an international centre of wine research and development, ensuring the region continues to stay ahead of the wine competition. It includes a series of pilot plants and facilities to assist new business start-ups. The US is the largest market for Priorat wines and the current global financial crisis with its American origins is likely to have a significant negative impact on the Priorat region.